The young man with a golden voice approached the inimitable composer M.S. Viswanathan for an opportunity to sing in Tamil cinema. “Your voice is commendable but your Tamil diction has to improve. Learn the language and come back,” MSV advised him. The youngster took almost four years to do it, before he returned to prove his mettle. And how! S.P. Balasubrahmanyam’s grit and perseverance has now taken him to a dais where he was asked to speak on Kannadasan! 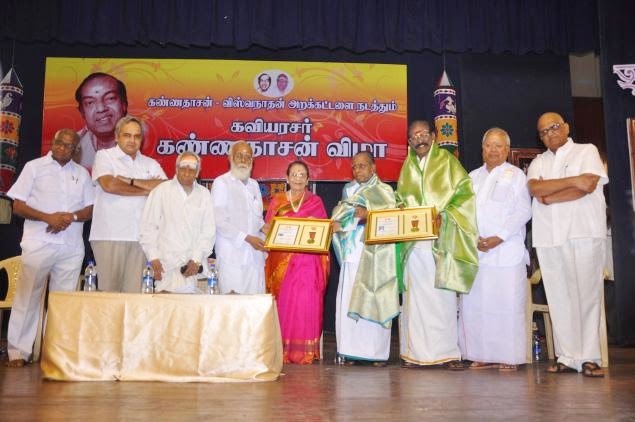 “I love the language,” he said, when he began his speech at the 11th anniversary celebrations of the Kannadasan-Viswanathan Trust held this past week at the Kumararaja Muthiah Auditorium, Raja Annamalaipuram. “I will sing some of Kannadasan’s lines that have touched me and yours too,” he explained. The combo of a medley interspersed with interesting inputs was crisp. His emotional one-liners added to the poignancy. It wasn’t just SPB’s numbers. He also brought alive the melodies of P.B. Srinivos and T.M. Soundarrajan. SPM at the end of SPB’s session and the crowd gladly obliged. Later near the door when SPM told Mrs. SPB, “Take care of your husband’s health. He is our treasure,” the veracity of the words was striking. “‘How do you compose such exquisite melodies,’ I once asked MSV. ‘I only bring out the music in Kannadasan’s lyrics,’ he told me,” SPB recalled. He seemed as much moved by the numbers he sang as he was by his exchanges with their creators. The invitees on the dais included Nalli Kuppuswamy Chetty and M. Murali (Sri Krishna Sweets). Pa. Lakshmanan of ‘Ilakkiya Sindhanai’ shared several interesting bytes about Kannadasan. His reference to Kannadasan’s wish to have a long life touched an emotional chord in the hearts of the audience. Dr. Meena Muthiah lighted the ceremonial lamp and Kannadasan devotee Kaviri Maindhan emceed the event. This year’s recipients of the Kannadasan Award were poet Aru. Nagappan and journalist Kayal Dinakaran. Student prize winners, including best speakers Simanjana and Nandini, were feted. Throughout the evening, S.P. Muthuraman was on his feet literally, making every speaker aware of the need to adhere to the time limit specified. But for such an efficient moderator the evening would have dragged on and made the audience restless.